You are here: Home » Back from the Yucatan! Shane and I had a great time in Mexico. We stayed at the Hotel Villa del Mar in Playa del Carmen (which was not without its problems, but it worked out in the end) and hung out on the beach, went snorkling, visited cenotes, traveled through the jungle, climbed Coba (well, I got about 2/3s of the way up before I realized I would need to come back down…), visited Chitchen Itza, Tulum, and Valladolid, knocked around Xel Ha, and generally ate and drank like it was our last week on Earth. At Coba on the Mayan encounter tour through Alltournative. Supposedly, this is the only Mayan pyramid tourists are now allowed to climb due to an accident at Chichen Itza. 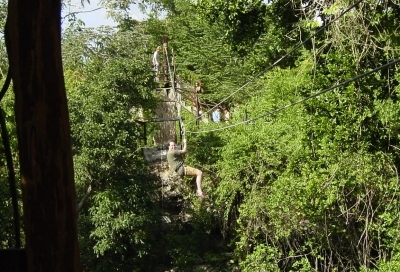 Shane zipline-ing through the jungle. I chose not to. One of the many dogs we saw just sort of rambling about. This one was snapped in a Maya village. In the background, you can see a few Mayan men sitting under a palapas roof, a traditional material used on many buildings and homes. This is the entrance to a cenote. And here’s the cenote! We were able to snorkle in this amazingly clear water — there were tiny fish and huge stalagmites everywhere. After kayaking and snorkling along the reef in Soliman bay, we had about an hour to hang on the beach, eat fruit, and drink agua frescas. It was heavenly. A few days later, we rented a car and set out for Chichen Itza and Valladolid. Some of the roads have been expanded but, for the most part, we traveled on this type of road. The pyramid at Chichen Itza! The day we went to Valladolid and Chichen Itza was the one day it rained. (The morning was cool and cloudy, perfect for knocking around Chichen). But then the skies opened up and the streets of Valladolid were flooded. I had high hopes for Valladolid based on our guidebook, but the recommended restaurant was pedestrian, the artisans’ market sold Hello Kitty backpacks, and the public mercado was deserted. So it was kind of Suckadolid. 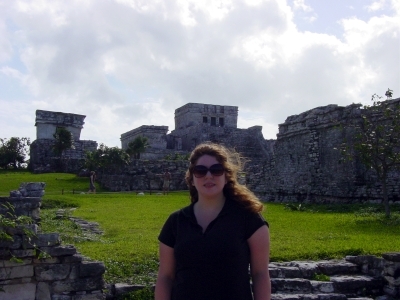 On our last full day in the Yucutan, we visited Tulum, the only Mayan ruin located on the Carribean. We thought it the prettiest of all we’d seen. Me at Tulum. I’m not smiling because I’d just drank a large bottle of water only to find out that there aren’t any restrooms in the immediate vacinity. After this we headed to Xel Ha, bought an underwater camera, and then promptly lost it. So, no pictures of Xel Ha! The morning we left, we had breakfast — again — at the Hotel Casa Tucan, just around the corner from where we stayed. 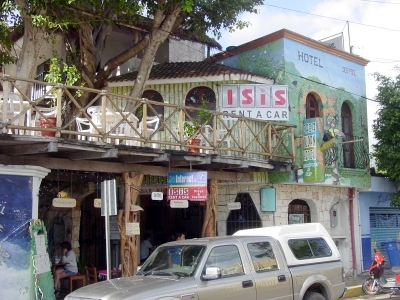 If we come back to Playa with the kids, we’ll probably stay here. It’s funky, charming, and pulls in an international clientel. And that’s it! It was lots of fun, and lovely to think about, especially when we’re at home stuck inside because there’s an ice storm outside!